Gjappy found this baby seal dancing in his house at his birthday! Besides being the best party-buddy it also decided to stick around to aid in battle. But once the music 's on it won't stop dancing! 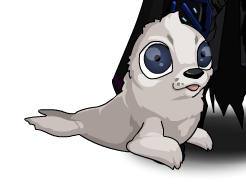 Note: Also see Baby Seal Battlepet (AC). Thanks to Adam1a1, GuardMice and Man With Moglin.